Combining the mystery of maritime lore with New Yorks unique history, this moonlit view from South Street Seaport captures the spirit and romance of New York in 1892. The Brooklyn Bridge provides a majestic backdrop for the square-rigged ship Largo Law, setting sail for the open sea with the help of a mighty tug. In the foreground, the ferryboat Farragut enters her slip near the Fulton Fish Market. 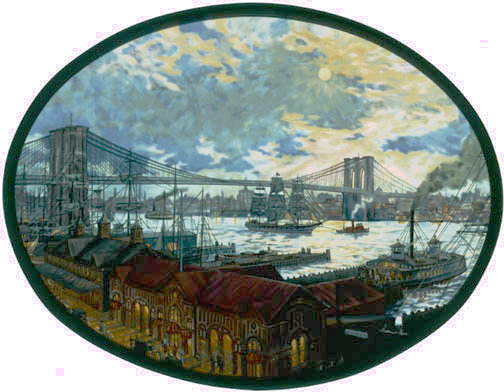 Bill Muller grew up near the Hudson River, where he was captivated by the old sidewheel river steamers. For several summers, he served as quartermaster-pilot on the Alexander Hamilton, the last of the classic sidewheelers. Today, Bill is a Fellow of the American Society of Marine Artists, and an elected-member of the Society of American Historical Artists. His award-winning paintings are a window into a distant time, filled with the strength, sensitivity and scholarship of a lifelong study of Americas maritime heritage.